To welcome the change is the bit difficult as it takes so much dynamism to be a part of something. It’s hard to resist and step out of the “Comfort Zone”, and that’s what human nature is. Well, the most successful and giant companies greet and welcome the change, seeking opportunities to win. This also helps them in making smart mover advantage. Encouraging for the creative and sound roadmap, the mentality to disrupt helps the entire organization to execute the tactical winning strategy. At Panacea, we mark it as future-ready for being updated as an e-Commerce development company. The future is coming very fastly in the digital age with the artificial intelligence. To have dynamic as an ability that is to adapt the change rapidly and regularly. Mature companies set the goals, initiate the plans, find the solutions, track the result and execute the required changes as quickly as possible. Depending upon the outcome of the results, the strategy continues or get change. Companies with digital maturity realize that constant change is the demand of their people. No matter technology made us efficient and effective; it had given more task to do. Companies trained their working professionals with modern tools and techniques to better skilled with the digital technologies. To do innovation is bit ignored, as daily searching, clicking, browsing, and administration consumes most of the attention. So, here comes Artificial Intelligence into the scene. It gives the opportunity to innovate the intelligent assistants that complete the task even faster and accurately. AI will be our most potent and emerging resource when companies will learn to use “intelligent assistant” for improving the revenue, customer satisfaction and reduction of the cost. So, after getting about what exactly market expects, let’s know about what Artificial Intelligence exactly is? Artificial Intelligence is a machine or the tool that manufacturers and distributors offer to the client through their digital e-Commerce experience. Traditionally, efforts are made by the humans to complete the particular task can now better manage and initiate by the AI-powered tools that are automatic and can complete the task even faster than the humans. These tools have the capability to analyze the large group of data sets, learn human languages, run a test, to generate predications etc. based on the use of the certain tools. Customer experience can be better understand and can drive as per the demand through the AI. Return on Investment shall be increased through proper strategizing and create a data more appropriately. 1. Improvement in Multi-channel Model: – You can create the better and stronger strategy about the behavior of your buyers, just by viewing the insights generated via AI. It can help you in taking better business decisions. 2. Proper management of Stock or Inventory:- With AI, you can analyze what market trend is and can stock according to the trend for the specific period in the year and also offer better management of inventory, helping in the reduction in the overheads. 3. To identify and automated the concerning activity: – To automate the certain task through machines or AI tools eventually helps in reducing the costs. A better example to explain is the classification of the product, in which, when there is a lack of confidence in seeking the decision of classification, human interference is the must. This will help them in reducing the optimum time required to identify the products and assist them in raising the working potential of employees and can make them work on more valuable initiatives. 4. Improve effectiveness and efficiency and can create rich persona: – It becomes easy to analyze the lower-level of web behaviors through the machine learning approach right from browsing to searching and clicked on to purchase. This helps in increasing the sales and reducing the churn, as it can implement through machine learning approach. 5. Faster answers to more questions through Omni-channels: – AI regarding conversational interfaces is becoming more famous. AI proactively answer the questions related to the customer’s demands and can be programmed according to the Buyers and their demands. So, right from customer service to track the shipments, AI can answers to customers efficiently. 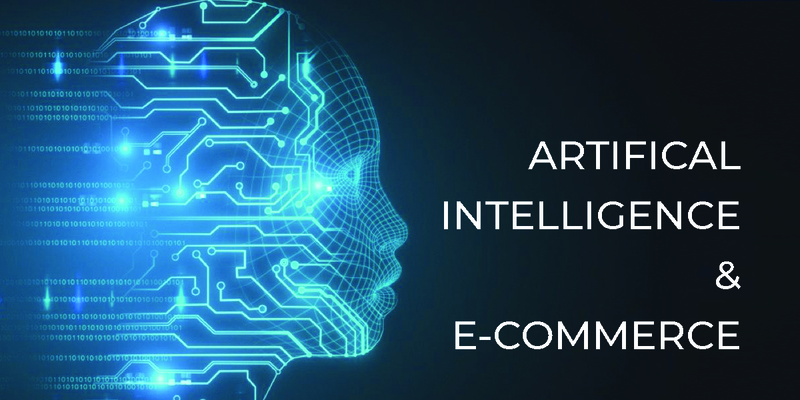 AI in the e-commerce segment can strongly help the enterprize to sell online. In this Virtual Era, products can be purchased through any digital platform at very low cost with unique features, customized options. This is undoubtedly the most crucial requirement for the e-Commerce market today. By including the AI into the regular task entrepreneurs of manufacturing concern and distributors, helps in meeting the demand of customer’s behavior and expectations. It is more important to understand the strategy and to implement it according to the desired need of the market, and to fulfill the gap in the current processes and to understand the business value of artificial intelligence.